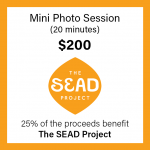 During the month of May, Scheid Studios will be running a fundraiser mini-session weekend on May 18-19, 2019, where 25% of the proceeds will benefit the SEAD Project. The SEAD Project (Southeast Asian Diaspora) is a community organization on a mission to be an accessible creative hub that provides streamlined workshops and tools to engage and share knowledge in Khmer, Hmong, Lao and Viet diaspora communities. Through safe and welcoming spaces, they hope to grow empowerment to plant the seeds of hope and possibility, locally and globally. Only $200! Includes a 20 minute photo session and three digital images with a photo release. Get a new headshot for your business or personal needs. Update your profile picture and support a great organization all at the same time! Book your session on May 18 or May 19 below. Next month’s fundraiser will support, Wee3Beasties, a feline rescue organization. Would you like to nominate a local non-profit for a future fundraiser? Organizations muse be local to the Twin Cities and have 501c3 status. Nominate them here.